Roast Lemon Chicken thighs with crispy skin, seared then oven baked for tender and juicy chicken full of flavour! Your new favourite chicken recipe is here! 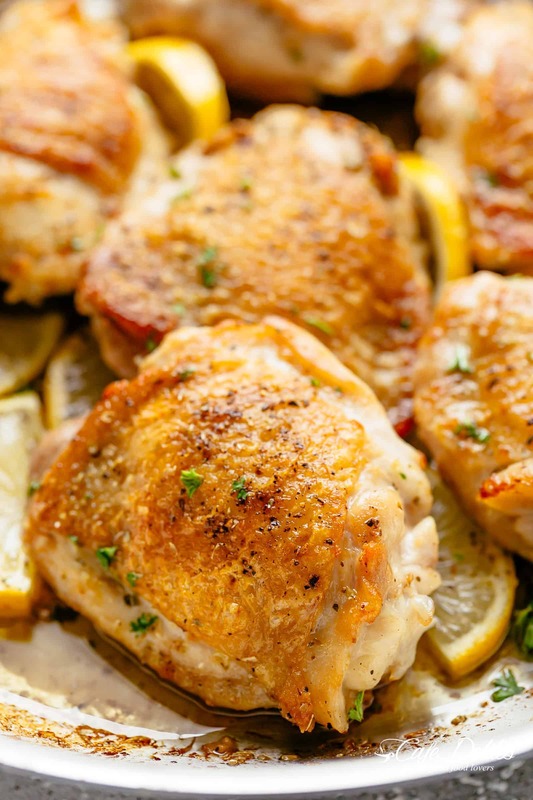 An easy Lemon Chicken recipe with a kick of garlic and a touch of herbs will fast become a requested chicken dinner. Simple to make with minimal ingredients and maximum flavour, this is one low carb meal the entire family will get behind! You all know how much I love a good, juicy whole roast chicken recipe, but my absolute most favourite parts of a chook are either legs or thighs. I know, I know most people hate dark meat and for those people, we have juicy baked chicken breasts. For today, however, these thighs are the shiznit! Bone-in, skin-on chicken thighs are an inexpensive cut of chicken that won’t kill your weekly food shop! Deliciously versatile, easy to make on either stove top or oven, nothing beats crispy skin on chicken! Due to the nature of this recipe, I recommend using thighs. If you want to use chicken breasts, I’d recommend using skin-on and bone-in for ultimate flavour. 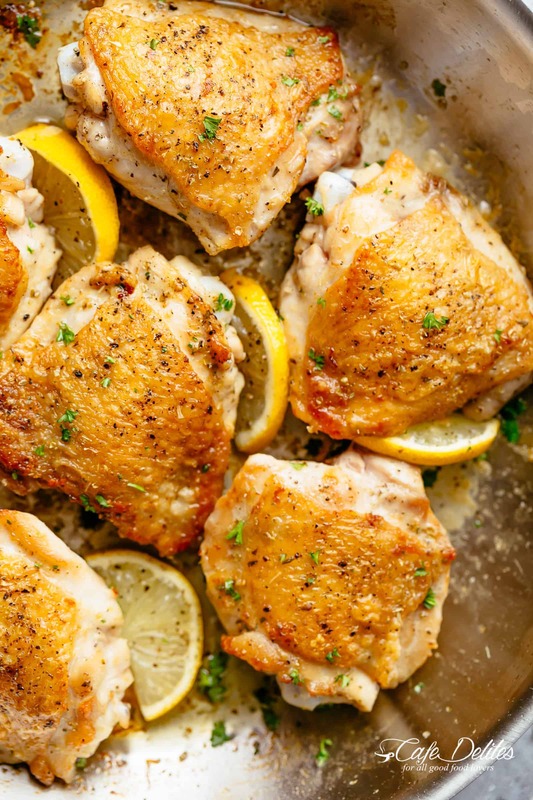 Our lemon chicken recipe starts off seared in a pan first. Searing skin-side down in a hot skillet over medium-high heat gives the skin time to get the crispy texture we love so much, while roasting them finishes cooking them off, giving you tender, juicy meat. Seasoned with only salt and pepper to avoid any other seasonings from burning in the hot pan, you’re going to sear your bone-in chicken thighs, UNDISTURBED, for a good 8-10 minutes — skin-side down first — to render the fat and get the skin nice and golden brown in colour. Thoroughly pat skin dry with a paper towel. This gets rid of any excess water from freezing or refrigeration. 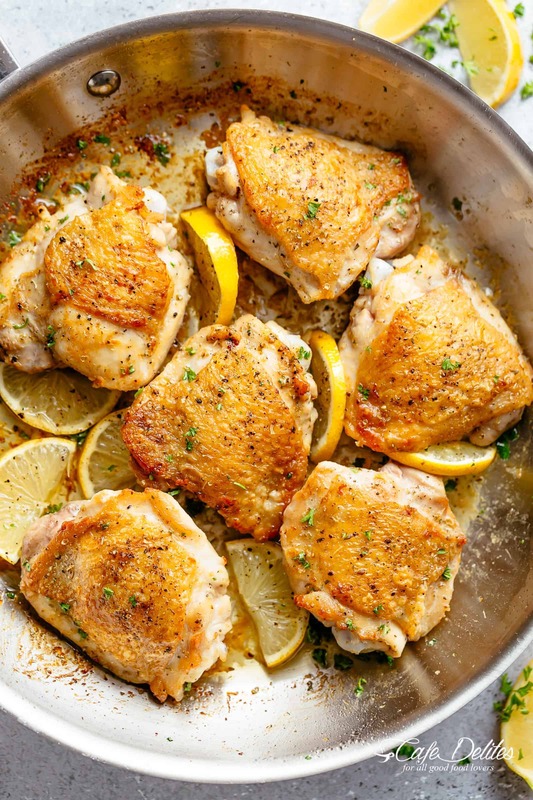 Use a cast iron skillet or oven-proof stainless steel pan and heat over medium heat until hot. Add in a tiny amount of oil (about 2 teaspoons) and wait for it to shimmer. When it’s hot enough, add your chicken as mentioned above. Once skin has seared, flip and continue searing the underside for a crispy, golden meat base. When adding in the rest of the ingredients, add them to the base of the pan without touching the skin to keep that skin as crunchy and crispy as possible. If wanting to baste the skin with the liquid ingredients, it won’t turn out as crispy as it was. Yes, the flavour will be present, but the pan seared crispiness will diminish a little. Transfer the pan or skillet to a hot oven and roast for 15 – 20 minutes until done and cooked through to the bone. Baste with pan juices when serving. Roast Lemon Chicken thighs with crispy skin pan, seared then oven baked for tender and juicy chicken full of flavour! Your new favourite chicken recipe is here! With a kick of garlic and a touch of herbs, simple to make with minimal ingredients and maximum flavour! Preheat oven to 220°C | 430°F. Thoroughly pat thighs dry with paper towel. Season with salt and pepper. Heat 2 teaspoons of oil in a large oven-proof pan or skillet over medium-high heat. When pan is HOT, sear chicken skin-side down for 8-10 minutes, until crispy and golden browned. Flip and sear the underside for another 8 minutes, until the meat is golden. 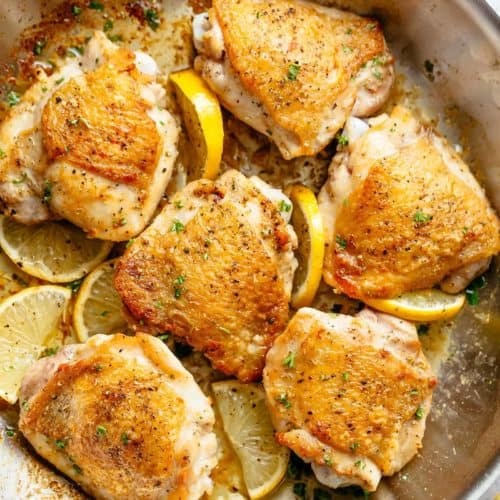 Move thighs to the side and add the garlic to the pan juices. Sauté until fragrant (30 seconds). Pour in the lemon juice and stock, then add in the herbs. Transfer chicken to hot oven and roast until completely cooked through (about 15-20 minutes). Garnish with extra parsley; taste test and adjust salt and pepper, if needed. Serve with lemon slices. *If using a dry white wine instead of chicken stock/broth, use a Sauv Blanc, Chardonnay or Pinot Grigio. I want to thank you for this recipe! My autistic son is the hardest kid to feed and have him sit and eat! But this recipe he ate 4 thighs and kept saying, “mama, so good! This is so good!” Thank you! This taste really good! As a lover of both garlic and lemon this was a hit for me and my partner. The chicken came out soo moist and flavorful. I did have an issue with the garlic and the herbs burning though so I wasn’t able to use much of the sauce. I added both while the pan was still very hot. Would lowering the heat of the stove before adding the both the garlic and the herbs reduce the likelihood of having these ingredients burn (The garlic started burning on the stove and I think the herbs burned while in the oven)? This looks great! Will it come out okay if I transfer it to a glass casserole dish ? I don’t have an oven friendly pan. Yes, that works great too! Enjoy your lemon chicken! Made this yesterday, WOW. Delicious. Was a really easy recipe and the taste was wonderful. Definitely going to make this again and tell my friends about this recipe. Only thing I didn’t have was garlic, what was I thinking, but it was great even without. This looks sooooo good. My wife doesn’t like garlic though. What would you substitute to give the chicken that rich tangy flavor of garlic? Hi, Karina. I don’t have a working oven so I’m restricted to stove-top (skillet), toaster oven or microwave. I need some variety so any recipes, books, suggestions, etc. you can forward I’d greatly appreciate. BTW, I only like legs, thighs, or wings. Thank you very much. You say to roast in a “hot” oven for an additional 15-20 minutes. What oven temperature is a “hot” oven?